Home » The Law & You » My Son Has Reading Issues. How Can I Get Him Help? My Son Has Reading Issues. How Can I Get Him Help? With his son beginning high school in the fall, a viewer is concerned about his reading issues. Is there anything that can be done? School litigation attorneys Greg Fellerman and Ed Ciarimboli tell him what to do next. Dave Kuharchik: We’re back with “The Law & You” and today we’re talking about a boy with reading problems. Let’s get to attorneys Greg Fellerman and Ed Ciarimboli from Fellerman and Ciarimboli in Kingston. Gentlemen, good to see you guys. Greg: Well the first thing you want to do is, obviously your child’s education is the most important thing to you and your child for their future, it’s always best to reach out to the school immediately. let them know he is having problems. They have people in the school districts specially set up to do this. They can set up special programs for your son or daughter to make sure your son or daughter’s needs are being addressed. Ed: I think that because they’re going from eighth grade to ninth grade and going into high school, it’s really a transition period for them. You want to make sure you’re being proactive. You want to make sure you’re getting to the guidance counselor, you’re getting to the principal, to the school administration early. The earlier you get to them and tell them what’s going on with your son or daughter, then you’re going to be able to sit down and come up with a plan. If the reading problems are severe enough, then the school can put into place what’s called an IEP or something of that nature and just give them the help that they’re going to need, so they can succeed in their education. Dave: Some great answers to today’s question, you may have additional questions, how can our viewers get in touch with you guys? Greg: They can get us on our web-site at 714hurt.com and call our office at 570-714-4878. Ed: They can like us on Facebook. When you like us on Facebook, if you have a new question you want us to answer, post it on our Facebook wall and we’ll do our best to make sure we address it on “The Law & You” segment. 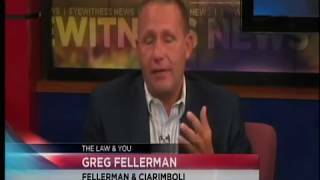 Dave: Attorneys Greg Fellerman and Ed Ciarimboli from Fellerman and Ciarimboli in Kingston. Thanks so much for being here we’ll see you again next time.